This is a Casein Gesso, made in the USA by Sinopia. It is ideal for preparing paper, canvas, plaster, metal and wooden panels for a range of painting and drawing techniques, and can be used directly out of the jar at room temperature. It can be thinned and cleaned up with water. Apply with a brush or roller in at least two coats and allow to dry overnight before sanding to the required smoothness or burnishing with a soft cloth. If you are using more than two coats of gesso, remember to apply them over a longer timeframe; no more than two coats a day. The recipe includes Water, Calcium Carbonate (Whiting), Cold Pressed Linseed Oil, Milk Protein (Casein), Natural Tree Resins, Fossilized Sea Shells, Saponified Olive Oil and Salt. 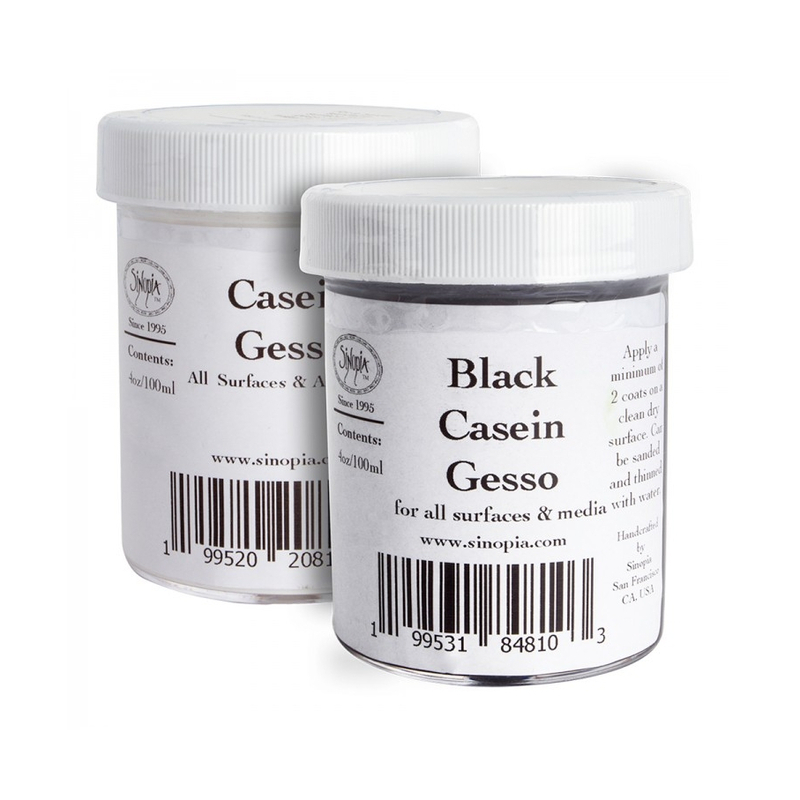 The Gesso is coloured with a deep, rich Bone Black Pigment, and while the mixture does contain some whiting (calcium carbonate), this is mainly there to give it some body. The resulting ground is ideal for laying down bole for watergilding or painting in media that requires an absorbent ground, such as Encaustic, Egg Tempera, Borax Casein or Watercolour/Gouache. Once applied and cured, the casein gesso forms a permanent and water-insoluble working ground.